2011 was a good year, and one which saw me eating out more than ever before – a fact that the dwindling recipes on the blog and extra inches around my waist will attest to. However this may not be apparent to (what’s left of) my regular readers, as despite the fervent restaurant-hopping I have developed a sort of ennuie with writing about it all, at times even leaving my camera at home *gasp* to concentrate on the conversations at the table and well, eating. As a result I’ve accumulated a fair few undocumented meals, some of which are probably worth a mention. I’ve lumped them together to present you with my lost posts of 2011. In part one I’ll be tackling the London establishments. To start, a few newcomers. 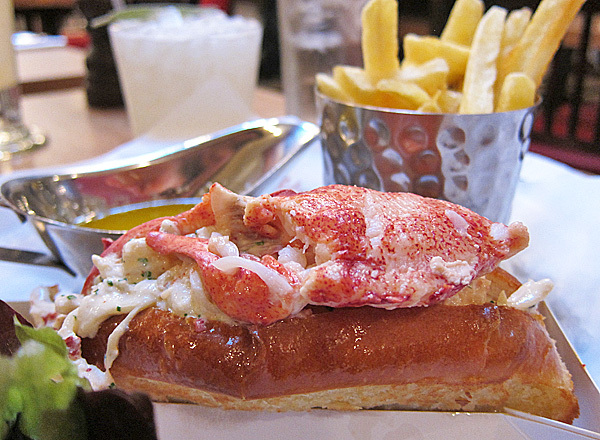 Burger and Lobster (from the folks who brought us Goodman) in Mayfair aspires to bring affordable lobsters to the masses, and at £20 a pop (served steamed, grilled or in a roll) they may well have achieved it. The cost may have been offset on the burgers, which at the same price doesn’t seem as much of a bargain. No matter, I shall be sticking to the juicy crustaceans – the lobster I had on my inaugural visit was sweet, meaty and perfectly cooked, tossed lightly in Japanese mayonnaise and piled on a toasted buttery brioche. I also love that the cocktail list has ‘B’ and ‘L’ cocktails so you can find the perfect tipple to pair with your choice of fodder. Australian celeb chef Bill Granger’s Granger & Co. fizzled in comparison. I stopped in at the casual all-day eatery a week or so after it opened to find the place bustling and the man himself floating around schmoozing guests. 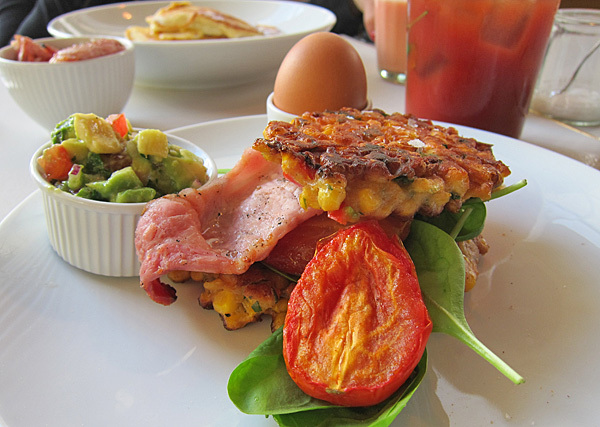 I chose Sweetcorn Fritters with Roast Tomato, Spinach and Bacon, and asked for extras of avocado salsa and poached egg only to be told that eggs came either scrambled or soft boiled. Reluctantly I settled for the latter, then wished I hadn’t after I cracked it open to find a solid yolk. The fritters themselves were nice enough, but my brunch companion’s Ricotta Hotcakes were stodgy and soggy, thankfully helped along by a side of bacon she had astutely ordered. We left unsatisfied and slightly annoyed to have dropped £50 on a mediocre breakfast. And to think roughly the same amount can buy you a 6-course dinner for one at Alyn Willliams at The Westbury! 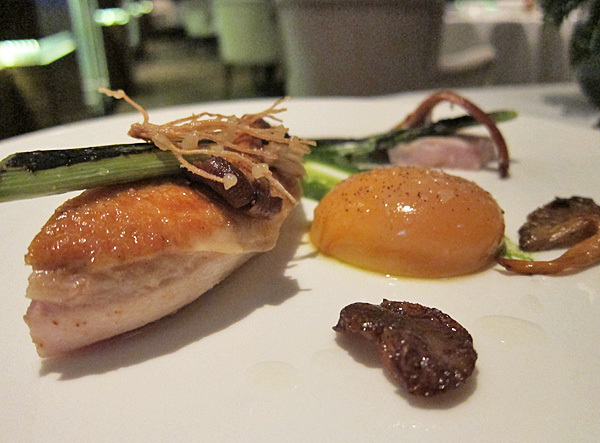 The steal of a tasting menu featured a main of tender sous-vide Chicken, Hen of the Woods, Smoked Egg Yolk and Charred Leek that was a real symphony of flavours and ranked up there with some of the best dishes we ate last year. B and I weren’t as taken with a couple of the starters (in particular some rather bland snails on malt soil) but points to the attentive staff who spotted our displeasure and comped us an extra dessert – a luscious deconstructed Persimmon Cheese Cake. Our pud off the menu (Chocolate Mousse with Caramel and Peanut Butter) was superb too. The fledgling restaurant from the former head chef at Marcus Wareing may still be finding its feet but there is potential aplenty. 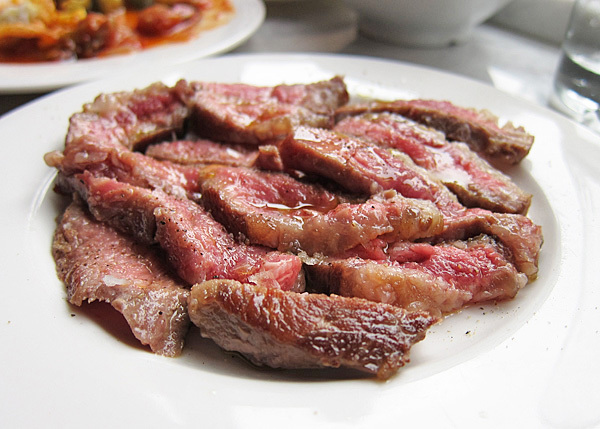 Something else I ate in 2011 that really stayed with me was the glorious fat-laced seared Pluma Ibérica at José, the now-not-so-new tapas spot in Bermondsey. That, and the tangy escabeche, crunchy croquetas, garlicky chilli prawns and sultry vegetable stew topped with a crusty golden fried egg, makes me eager to try owner José Pizarro’s larger and more recent addition Pizarro, just down the road. I was charmed by the simple but lovely Corner Room, hidden away within the Town Hall hotel where sister restaurant Viajante resides. 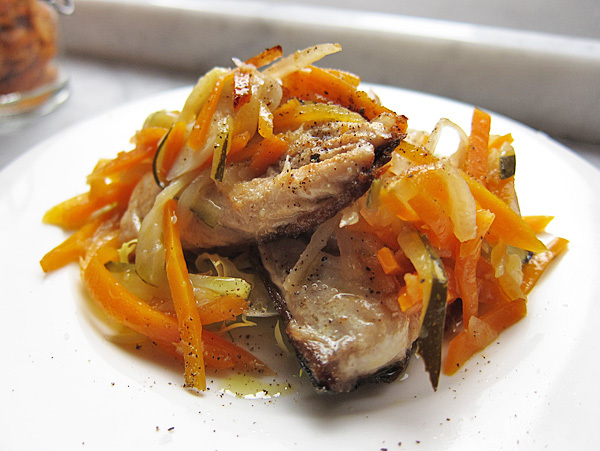 I loved all that I sampled there – pared down versions of Nuno Mendes’ cutting edge cuisine – delicate Sea Bass Ceviche with Broad Beans, Pork with Portuguese Bread Pudding (an intriguing savoury tomato and bread concoction) and succulent Lamb Rump and Belly with Baby Vegetables. The above meal was the precursor to a brilliant cocktail tasting at Viajante Bar – four whimsical cocktails paired with small bites from the Viajante kitchen. One gin-based cucumber and mint creation frothed pretty yuzu bubbles, while another, served in soup bowls, boasted fennel heart, spinach, beetroot glass and large yoghurt ‘stones’ that we were encouraged to lift with our hands and take bites from. Snacks like Duck Heart with Leek Ash Mayonnaise and Mushroom Floss were no less innovative. 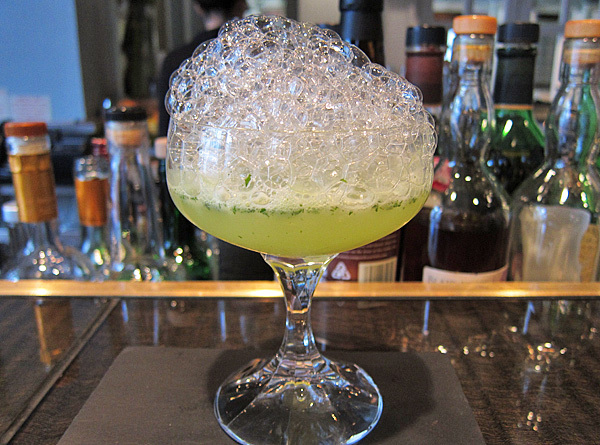 Sadly the food-paired tastings have been shelved as the genius bartender behind them (Alex McKechnie) has moved on. He does have a few projects in the pipeline, so do keep an eye on his site. Much praise has been heaped on Medlar since it took residency on the far end of King’s Road, yet for me it failed to live up to the hype. 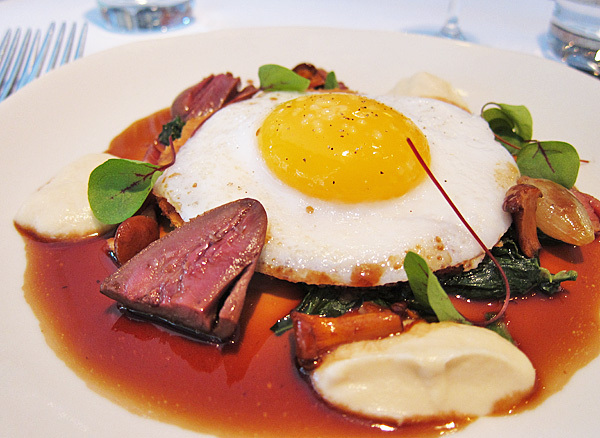 Yes, everything was cooked impeccably (as one would expect from the ex-sous chef at Chez Bruce) but none of it set my pulse racing, although the Duck Egg Tart with Red Wine Sauce, Turnip Purée, Lardons, Sorrel and sautéed Duck Hearts was pretty darn tasty. Admittedly my experience may have been tarnished by being served flat champagne, then condescendingly told that the house champagne is not characteristically bubbly before being begrudgingly poured a far more effervescent smaller glass from a fresh bottle (it later transpired that the original glass was from a bottle opened the day before). 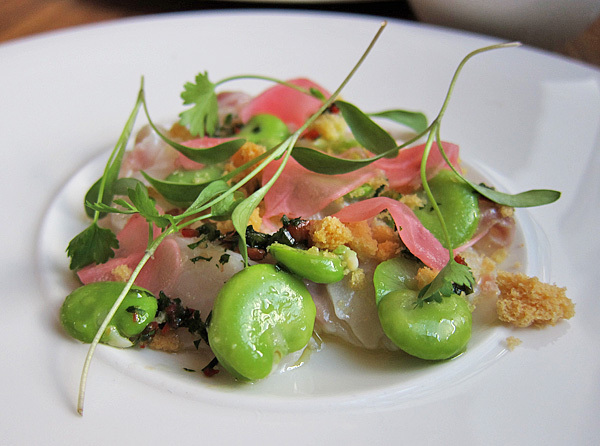 Last year marked the rise of the no-reservations gaff, and with the exception of Alyn Williams and Medlar, all the above mentioned establishments cater to walk-ins only. Russell Norman, king of walk-in dining in Soho, added a staggering three new restaurants to his stable all within walking distance of one another: Spuntino, da Polpo and Mishkin’s. 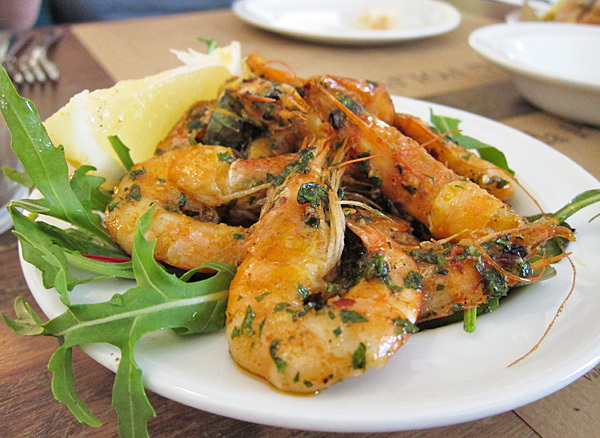 I went to all – savouring a Peanut Butter & Jelly Ice Cream Sandwich at the first, got down and dirty with finger-lickin-good Chilli and Garlic Prawns at the second and swooned over a miniature meatloaf at the third. Of the three, I was drawn most to the Jewish deli inspired nosh at Mishkin’s but apparently service levels have dipped since the opening so I’ll save my final verdict till after my return visit! Royal China‘s three month closure of its Bayswater branch (for refurb) saw us search high and low for a weekly dim sum fix. 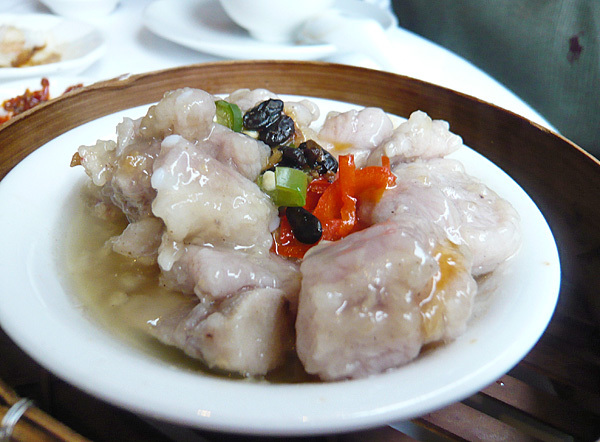 Pearl Liang, Princess Garden and Plum Valley all failed to satisfy, with the latter being really quite poor. Happily Royal China is back open with a nice facelift so you’ll find B and I back there most Sundays, although we really need to get ourselves down to Dragon Palace this year. We did however finally make it to Ba Shan, and aside from an over-salted dish of fried intestines, we quite enjoyed the fiery Hunanese and Sichuanese cuisine on offer. 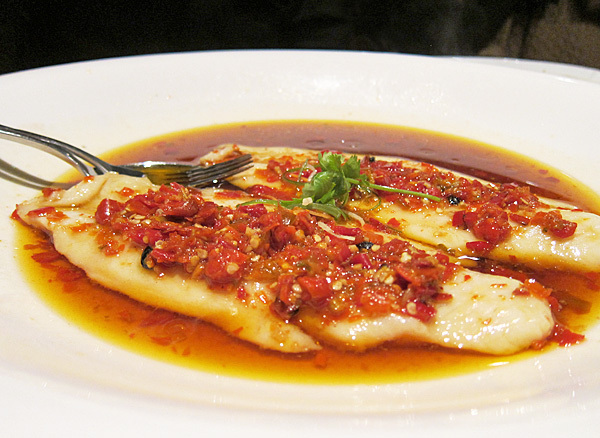 The standout dish by far was the Steamed Catfish with Chilli – generous silky fish fillets complemented by a perfect mix of salty, sweet, sour and spicy. Annoyingly the service was very slow, and a plate of dumplings we ordered never materialised. An early supper at nearby Bocca di Lupo was pleasant; the food better than I remembered it to be on my previous visit a couple of years ago. 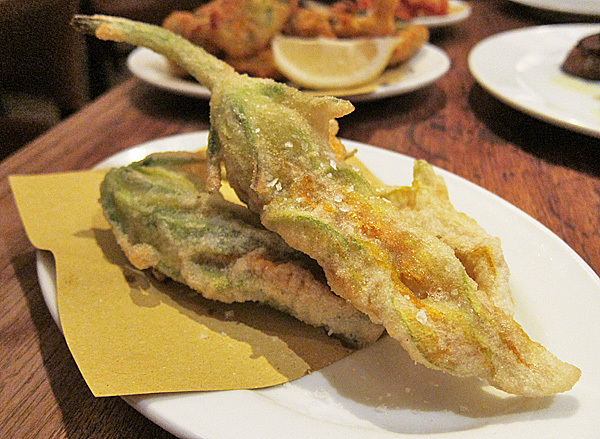 The deep-fried plates (courgette flowers, prawns, aubergine) were expertly done – light, crisp and greaseless; hearty blood sausage and mushroom crostini hit the spot too. A hunk of suckling pig did err on the dry side, but otherwise Kenedy’s regional Italian cooking was solid. I had thought the only Japanese to be had in Knightsbridge was at spendy Zuma or the dodgy-looking Satori Robata across from The Berkeley. That was until a friend brought me to Kura, a tiny family-run joint that has been dishing up home style Japanese fare to those in the know for over a decade. 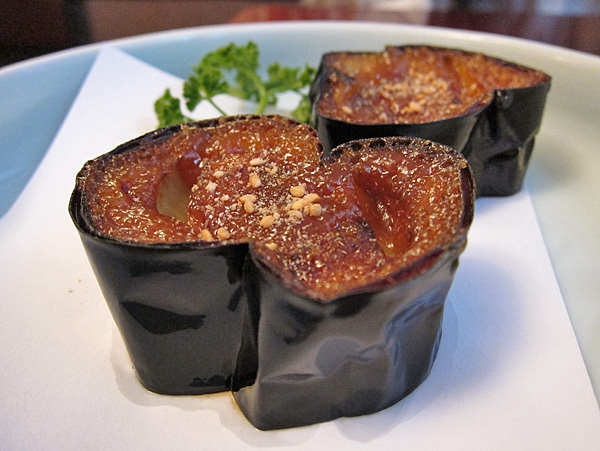 Familiar items like Tori Karaage (fried chicken), Agedashi Tofu (fried beancurd) and grilled Salmon Head were all delicious, and their Nasu Dengaku (miso aubergine) was one of the best I’ve tasted. 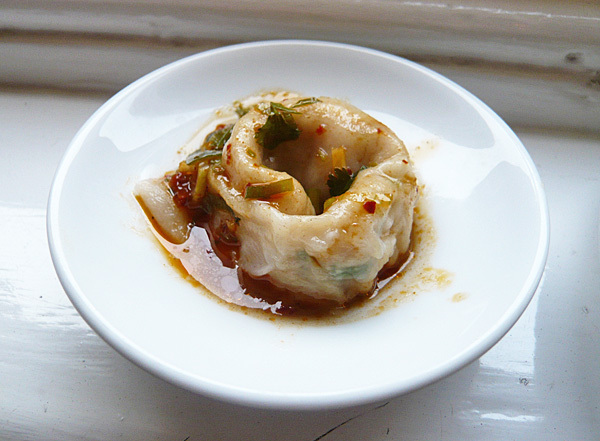 Another welcome discovery was Hunan in Belgravia. The deceptively named restaurant (the food actually takes more of a Taiwanese than Hunanese slant) refreshingly has no menu; instead a string of surprise small plates were presented banquet style, all of which were really quite good. I was especially keen on the numerous offal dishes and the aromatic crab noodles in a chilli lemongrass broth. The wine list was unexpectedly accomplished, as the chef’s son Michael is somewhat of a wine buff. 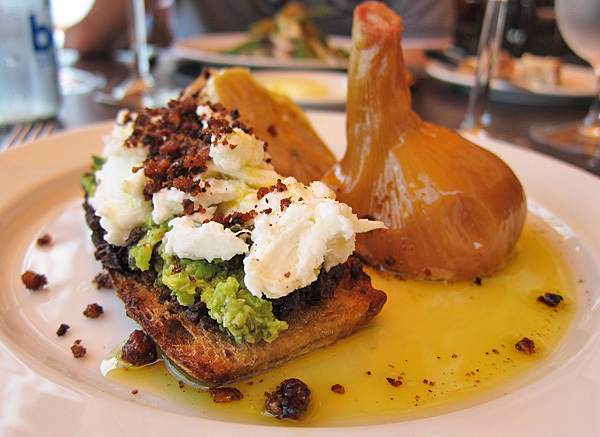 A weekend trip to the Design Museum led to lunch at Blueprint Café (at the time Jeremy Lee was still behind the stove) where we had a delightful starter of Baked Garlic, Grilled Bread, Mozzarella, Tapenade and Broad Beans. Unfortunately everything else we sampled was ordinary at best – slices of Lamb Roast were dry, overcooked and tasted as if they had sat under a heat lamp too long – we would have done better at Butlers Wharf Chop House next door. More disappointing was the vegetarian tasting menu we had at Sketch Lecture Room & Library, the only Michelin-starred restaurant of the bunch. To be honest I don’t remember much of it (says it all really) except that it was uninspiring and terribly expensive. The seaweed butter was lovely though. So there we have it – a smattering of my neglected meals of 2011. Stay tuned for part deux, when I’ll be covering a few UK eateries outside of London as well as various locations overseas. 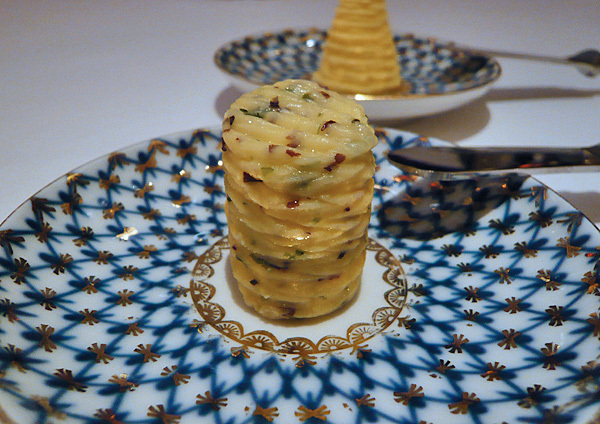 ~ by gourmettraveller on January 11, 2012. Everything looks delicious! I’m sorry some disappointed, but I have to say (being an enthusiastic home cook) I’m impressed! Man you ate well last year. Lovely roundup and gorgeous photos. Keep up the good work (and eating) in 2012. WOW wow wow. A brilliant round up but also a lot to look forward to in 2012. Lovely pics. Shame about what happened at Medlar, that’s just not right. Naughty naughty. Looks like The Westbury should be visited! Really would like to go to the Corner Room too, even though i wasn’t hugely enamoured by Viajante. I also loved Jose, perhaps more than I did Pizarro as I preferred the casualness of it all.